SAND HOLLOW GOLF CLUB - JUST 40 MINUTES IN UTAH! EASILY ADD LAS VEGAS COURSES TOO! WE BOOK EM ALL! CORAL CANYON GOLF CLUB - ONLY 40 MINS IN UTAH! It’s no doubt some of the courses in Mesquite have elevated to world-wide “Bucket List” status among those looking to experience the most unique and jaw-dropping golf landscapes an in the world. Mesquite is home to otherworldly looking desert canyons, which a few lucky golf architects carved fantasy-like oasis golf holes inspiring golfers to travel from all over the world to experience. It wasn’t long ago the remote town of Mesquite, Nevada was but a neon blur along Interstate 15 en route to Las Vegas. Today, this little town has evolved into one of the hottest, most talked about golf destinations in the country. 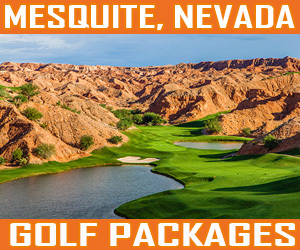 Are you looking for trusted knowledge about Mesquite Golf Packages? Do you want to know what Mesquite Golf Courses to play, where to stay, where to eat and gain a little local insight in Mesquite? Perfect! We’re the #1 golf booking company in the area, and have been helping golfers just like you for over 12 years visit Mesquite. Let us help you Get A Quote today! Our Best Trip Yet, Really Well Done Guys. Thank You! “Just wanted to let you know that our golf adventure went off without a hitch thanks to your careful planning and attention to detail. All eight of us had a splendid time, best trip yet!” – Bill H.
GET A MESQUITE GOLF PACKAGE QUOTE NOW - OUR CUSTOMERS LOVE OUR HELP! Our staff are experienced golfers and savvy travel professionals who know exactly how to help golf vacationers create a perfect golf & gamblin’ getaway. With this website and our simple quotes and booking system, we’ll help you create and book a Mesquite Golf Package quickly and conveniently. We have the experience, confidence and insight to make your Mesquite golf vacation easy and truly unforgettable. MesquiteGolfCourses.com is operated by GolfPackagePros, a talented team of well-traveled golfers, including award-winning golf course photographer Brian Oar, veteran golf travel writers, and an established golf packaging company. Our staff has been covering and booking Mesquite, Nevada golf for 12 years and helping guests like you enjoy memorable golf vacations in other popular golf destinations the western United States. Do you still need another reason to book your golf vacation with us…umm well okay? MequiteGolfCourses.com & uses https 256-bit SSL site-wide security by GoDaddy to securely lock down our entire website, payments and information! See our GREEN PADLOCK in the address bar? Safe and secure!